Chaco Culture NHP hosts the densest and most exceptional concentration of pueblos in the American Southwest and is a UNESCO World Heritage Site, located in remote northwestern New Mexico, between Albuquerque and Farmington, USA. 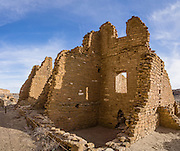 From 850 AD to 1250 AD, Chaco Canyon advanced then declined as a major center of culture for the Ancient Pueblo Peoples. Chacoans quarried sandstone blocks and hauled timber from great distances, assembling fifteen major complexes that remained the largest buildings in North America until the 1800s. Climate change may have led to its abandonment, beginning with a 50-year drought starting in 1130.